Oh boy, the coffee puns are flowing almost as strong as the ‘liquid life’ itself. Espresso Yourself. Live La Vida Mocha. Bean There, Done That. It is evident we were inspired during (0r maybe just on a coffee buzz following) our visit to Liquid Life – located about a quarter mile from The Tides hotel. It’s a wonderful place to get caught up on your emails, or scroll through your Facebook and Instagram feeds, making sure to ‘like’ our photos, of course. The decor is classy coastal – with whitewashed walls, a cozy mint green couch, industrial chairs and tables, a hanging swing and outdoor seating. We ordered a Dirty Chai (that’s a chai tea latte with a shot of espresso) because they’re our favorite. Liquid Life’s version was one of the best we’ve ever had. We also could not resist the Mountain Berry Muffin, and we’re glad we didn’t. It was love at first bite. The coffee shop has tons of baked goods like muffins, cookies, scones and coffee cakes to accompany your beverage of choice. Bagels and breakfast sandwiches and sliders (oh my!) are a great start to a beach day. They also serve fresh paninis, soups and salads for lunch, when you need a break from the beach. They’re not the frozen variety, but made-to-order … and delicious. The brewed coffee and espresso drinks are really good, because they use locally roasted beans. 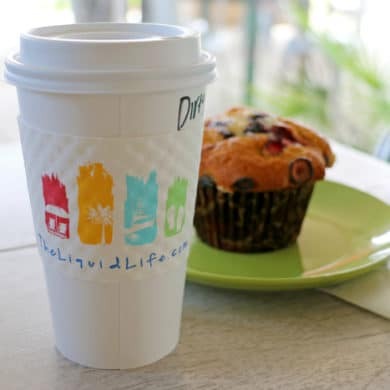 Liquid Life offers seasonal specialty lattes, as well as signature drinks like the Gingerbread, Salted Caramel or Banana Nut Lattes. If you’re not looking for a caffeine boost, try a fresh fruit smoothie or trendy smoothie bowl, which is basically a smoothie served like soup in a bowl, with a heaping portion of the ingredients found inside placed on top. If you’re a tea lover, enjoy varieties such as traditional Earl Grey, or the slightly more interesting African Sunset, Moroccan Mint and Green Passion, to name a few. We have one thing to say to Liquid Life – thanks ‘a latte’ for being more than your ‘average joe’. Liquid Life Cafe is located at 25741 Perdido Beach Boulevard, Building A, Suite M in Orange Beach AL. For more information or menu offerings, visit the Liquid Life website or call (251) 968-3758.